The NBA’s best three-point shooter is now … Pau Gasol?! As you may know, I make my home in LA. I spent many years living a double life as both a Laker fan and a Spurs fan before going all-in for the Spurs several years ago. As a result, the years between 2000 and 2010 were very, very good for me – virtually every year one of my teams played in the NBA Finals. The last good years in Laker-land came about because of the last good trade the Lakers made, when they acquired Pau Gasol from the Grizzlies. My familiarity with Pau came in handy when PtR czar J.R. Wilco asked me before this season to provide a former Laker fan’s view on what Spurs fans could expect from Pau in San Antonio. Interestingly, with one notable exception, Pau’s stats last year compare favorably with the year the Lakers beat the hated Celtics in the 2010 Finals. That year, in 37 minutes a game, he averaged 18 points, 11 boards, 3.4 assists and 1.7 blocks. Last year with the Bulls, in 32 minutes a game, he averaged 16.5 points, 11 boards, 4.1 assists and 2 blocks. The notable, and concerning, exception: His shooting percentage last year was 47%, down from 53% with the Lakers in 2009-2010. One would hope that playing in the Spurs system will get him better shots than whatever you would call the Bulls offense last year. How did Pau’s stats with the Spurs compare? While his overall numbers were down because he only played 25 minutes a game (instead of 37 in LA and 32 in Chicago), his per 36 minutes stats for this season were 17.8 points per game, 11.2 rebounds, 3.3 assists and 1.6 blocks. Virtually identical to the 18/11/3.4/1.7 line Laker fans enjoyed from Prime Pau in purple and gold. How about my prediction that his shooting percentage would go back up playing in the Spurs system? Bingo! His overall shooting percentage was 50.2 percent, and his three-point percentage a stunning 53.8 percent. 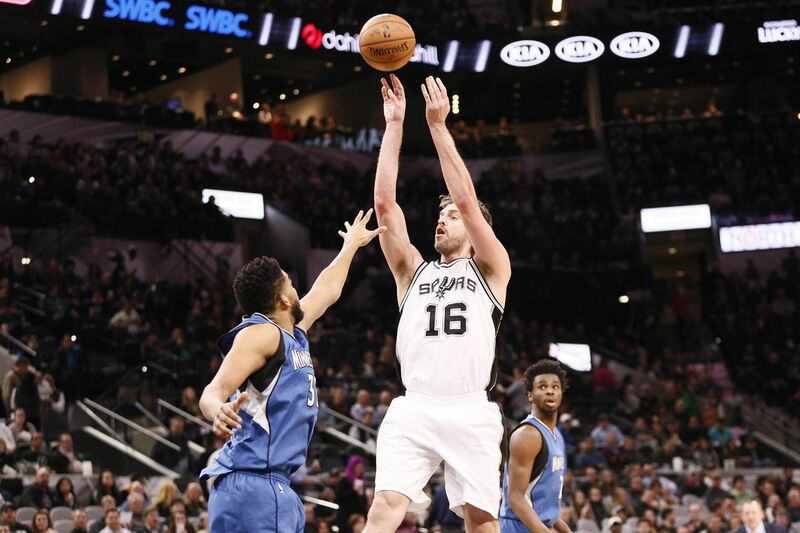 If you asked anyone outside of San Antonio who led the NBA in three point percentage this season, very few would give the right answer – Pau Gasol. In fact, he blew away the competition. Kyle Korver was second at 45.1%. And, yes, Pau shot enough threes to qualify. Here’s the complete list of the top shooters in 2016-17. Even more remarkably, Pau set a single season record for three point percentage. The record going into this season was Kyle Korver’s 53.6% in 2009-2010 with the Utah Jazz. Not anymore. And Pau breaking that record is surely something no one predicted. Of course, the high three-point shooting percentage masks the fact that (while his overall field goal percentage was over .500) his two-point percentage was again below 50%. I suppose that means Pau should take after my game and fire up more threes. Let it fly! I don’t think we can honestly say that Pau was “average or slightly above” on defense for the Spurs. Indeed, I am fairly confident that one of the reasons Pop has been happy with Pau coming off the bench, instead of starting, is that Pau doesn’t have to defend the other team’s best post players as much. Perhaps more importantly, it also means he doesn’t have to defend the other team’s starting point guards on the pick and roll – put simply, he can’t. With opposing teams shortening their benches for the playoffs, it will be interesting to see if Pau’s minutes decrease in the playoffs. If that happens, you can be sure it will be based on his defense, not his offense. As predicted here before the season, the Spurs offensive system has been very, very good for Pau Gasol.